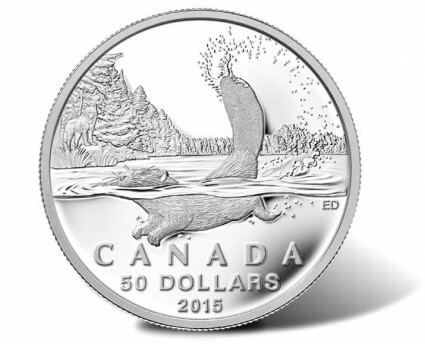 The third edition from the Royal Canadian Mint’s series of $50 silver coins that sell at face value is the 2015 $50 Beaver Silver Coin. Available tax-free and shipped free throughout the United States and Canada, the collectible proof coin is struck from 99.99% fine silver to a weight of 15.87 grams. Its maximum mintage at 100,000 matches the first release, the 2014 $50 for $50 Polar Bear Silver Coin, which sold out. The second coin from the series, the 2014 $50 for $50 Polar Bear Silver Coin, has a 90,000 mintage and is at 85% of sales as of December 12. This program of coins is similar to the Royal Canadian Mint’s $20 for $20 series that debuted in 2012. Fourteen have been issued and all have sold out. Then there is the $100 for $100 series which was introduced in 2013. Three silver coins from it have been issued so far. All of them have sold out. Collectors have been drawn to these type coins due to their unique and changing designs, their silver content and their prices as coins sell at their legal tender values. $50 for $50 silver coins have a melt value equal to just over one-half troy ounce of silver. Canadian artist Emily Damstra crafted this coin’s reverse. The image shows a beaver swimming with a wolf and Canadian landscape in the background. Around the scene are inscriptions of CANADA, 50 DOLLARS, 2015 and Damstra’s initials ED. Susanna Blunt’s portrait of Queen Elizabeth II graces the obverse. Inscriptions include ELIZABETH II and D.G. REGINA. Coins arrive within a protective pouch that is attached to an illustrated display card. The card offers an image of a beaver on the front. Inside with the coin are its specifications and a Royal Canadian Mint certificate of authenticity. Order 2015 $50 Beaver Silver Coins from the Royal Canadian Mint website at mint.ca. There is a household restriction of three coins. The following affiliate link goes to the RCM’s $50 for $50 page . There, the Mint also has a subscription option that enables buyers to automatically receive new coins as they are released. Credit cards are charged when a new coin ships.